PVN Patient Partner Delia Cooper won the Leadership in Advancing the Patient Voice Award in the BC Patient Safety & Quality Council’s 2017 Quality Awards. Delia was recognized for her dedicated volunteerism supporting those with arthritis and other chronic conditions. 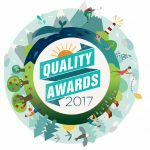 Quality Award winners each receive a $2,500 sponsorship to support ongoing development and disseminate learning from their work. We checked in with Delia to see how she used her sponsorship over the past year, and her response was truly inspiring! I must say that I was thrilled to receive the 2017 Leadership in Advancing the Patient Voice award last year. I think the $2,500 was well spent and the timing was perfect for the groups that I am affiliated with. 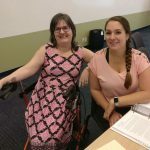 I facilitate Hang Tough (the arthritis support group in the Tri-Cities) and I am a member of the Canadian Immunodeficiencies Patient Organization (CIPO)’s support group. Last year I was terribly concerned about the loss of prescription medications for numerous people who had long-term chronic diseases (various forms of arthritis) and were in chronic pain. Their doctors were no longer comfortable prescribing opioids and these people were suffering greatly. I could see the complete loss of function as they withdrew from our exercise classes, meetings and coffee/lunch groups and once again became immobilized, deformed and severely disabled. Their pain was dreadful and completely debilitating. My first thought was that we needed to host a pain forum, because education is always the first step in addressing problems. I contacted the Arthritis Society and asked them if they could bring a forum on pain to the Tri-Cities with the help of $1,000 from my award. They were most agreeable, and the date for the Pain and Arthritis Forum was set for May 13, 2017 in Coquitlam. This forum was over-registered and many people told me that they could not get in because it was full. I was somewhat disappointed that we had to have a cap on the session, because I think we could have accommodated more people even if we had to set up some chairs in the hallway. The OA Nurse from OASIS, to talk about chronic pain, how it works and what you can do to address your pain. This person was extremely knowledgeable and helpful. A pharmacist to inform us about pain medications and side effects. A speaker from Pain BC who was knowledgeable about the current prescribing process which Doctors of BC is undergoing and which the College of Physicians and Surgeons of BC has been enforcing since June 2016. This person was able to inform us about the situation and update us on any new initiatives taking place to address this crisis for many people. 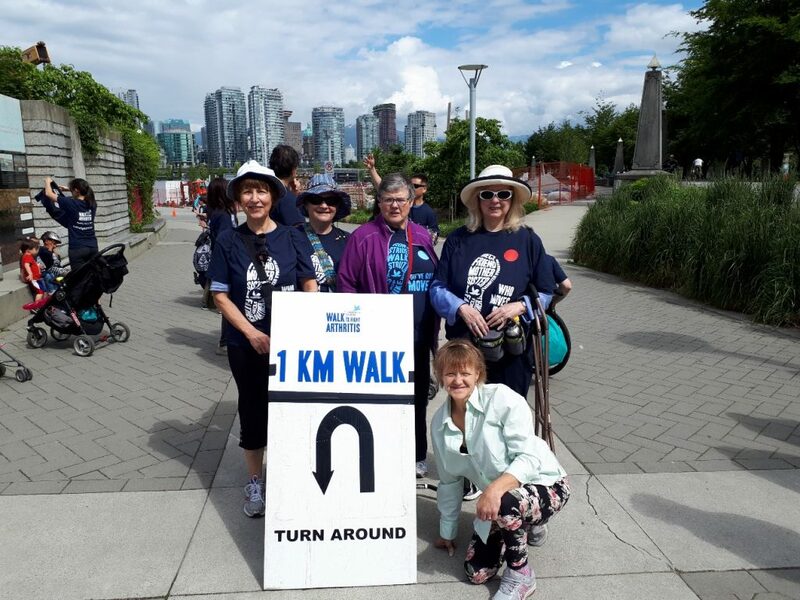 Delia Cooper (top right) with members of the Hang Tough arthritis support group at the 2017 Walk to Fight Arthritis. My second concern in the spring of 2017 was that CIPO decided they could not afford to hold an annual forum in the Lower Mainland or BC because of the high cost of renting facilities. So, I donated $1,000 of my sponsorship to CIPO with the express purpose of holding an education day in Burnaby. 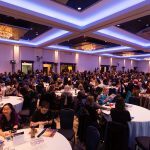 Combined with the support of another rare disease blood disorder group (Hereditary Angioedema Canada), we were able to have a wonderful event at the Firefighters Hall in Burnaby on May 27, 2017 – the CIPO/HAE Canada Patient Education Day (click here to see the agenda). The reason it is so important that these education days are held annually is because newly diagnosed people are often left with no one to turn to and are frequently too embarrassed to ask their doctors the truly burning questions they have. When I was diagnosed with primary immune deficiency many years ago the doctor simply said that one day I would get a terrible infection that I would not be able to recover from – I would be given intravenous immunoglobulin (IVIG) and I probably would not live more than two years after that. So you know how I felt when I had to start the IVIG! It was only after meeting other people with similar problems at one of these forums that I was able to move forward optimistically in my life. With the final $500 from the award, I paid my hotel costs for the Quality Forum (I shared a room with another PVN member so that we could stay over two nights fairly reasonably), and I donated to several walkers from the Hang Tough group in support of the Walk to Fight Arthritis on June 4, 2017. The purpose of supporting these Hang Tough members was to encourage them to go downtown on a Sunday morning and discover how pleasant it was to participate in this event. My hope is that they will come next year too. I know that the $2,500 that I received was extremely valuable to the community I live in as well as to patients who have arthritis or immune deficiencies. Since I facilitate Hang Tough, I have access to personal stories and problems that most people in our community are unaware of. It was extremely gratifying to be able to address some of the needs I saw in 2017 because of this award. Once again, thank you very much! Does Delia’s story remind you of someone else doing great work to improve the quality of care in BC? Nominate them for a Quality Award! BCPSQC has just launched this year’s Quality Awards, and is accepting nominations until July 15, 2018. Click here to learn about the awards program and find out how you can make a nomination! This entry was posted in Guest Posts, PVN Volunteers, Success Stories.